What better (or wurst) place to celebrate a meat-heavy festival like Octoberfest than in a butcher shop? 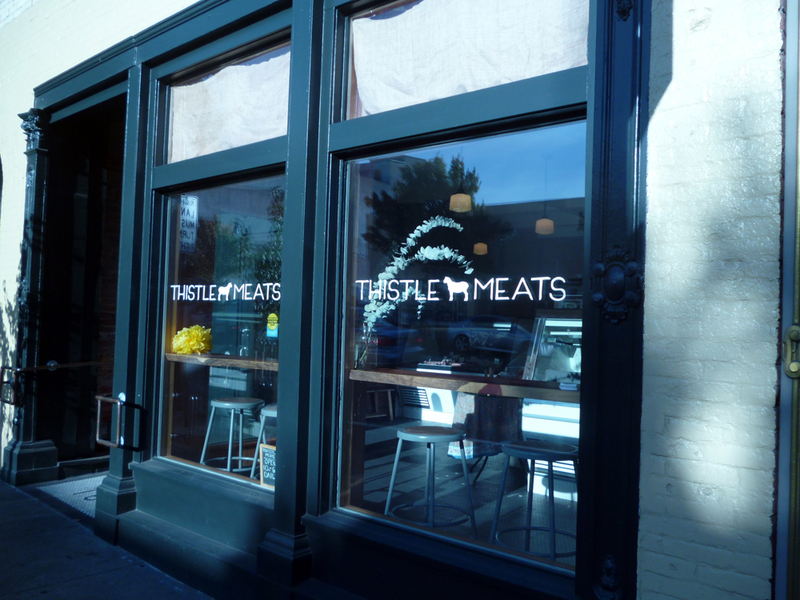 On Monday, October 27, Petaluma's Thistle Meats will be teaming up with local chef Mark Malicki to offer the shop's third pop-up dinner. There will be plenty of meat on offer, from a house-made charcuterie plate and raw grass-fed beef with horseradish cream and smoked salt to choucroute garnie with sauerkraut, house-made bratwurst and sausage, braised rabbit and pork belly, plus breaded pork cutlets with "Brussels kraut" and a fried egg. Also planned are potato pancakes with applesauce and sour cream; beet and butter lettuce salad; smoked sturgeon with leeks and buckwheat crepes; "pot-roasted" celery root; and wild king salmon with savoy cabbage, fennel, dill, and Gravenstein apple. In keeping with the Octoberfest theme, Thistle Meats will be supplanting the 24 bistro-style seats set up around the shop's butcher table with beer garden benches and picnic tables out back (bring your sweaters!) They'll also be taking reservations this time, while still leaving seats open for walk-ins. Thistle Meats owner Molly Best, a Petaluma native, had wanted to work with Malicki for over a year, since she had first tasted the delicious and very inventive food he was cooking several nights a week at the Casino Bar and Grill, a longtime dive bar and locals' hangout in the small West Sonoma town of Bodega. "He had a freedom, a creativity," to his style of cooking that Best admired and felt would be a great fit with her future shop. 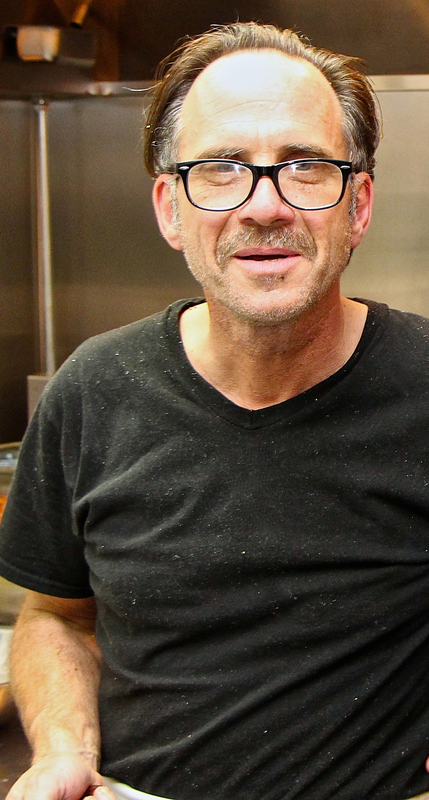 Equally important, a chef who could produce great food in a cramped, bar-noisy space on nothing but a flat-top griddle and a few burners, as Malicki was, would probably be able to roll with the challenges of running a pop-up bistro in a butcher shop. Once Thistle Meats opened in early 2014, Malicki "became a great customer," Best said. They launched the first pop-up dinner in September; they hope to continue hosting the dinners every other Monday. "It's fun, it gets the staff inspired, it's rewarding," said Best, and so far, the community response has been even better than they expected. "It has the feeling of a supperclub," said Best. "It's very intimate; the setting is super-casual but you're totally taken care of." Later seatings often include the shop's butchers, along with regular customers and industry folks from other local food- and wine-related businesses. Thistle Meats' focus is on whole-animal butchery, using meat from pasture-raised, grass-fed animals; Kent Schoberle, Thistle's head butcher, oversees the breakdown of whole pigs, lambs, goats, and sides of beef each week. 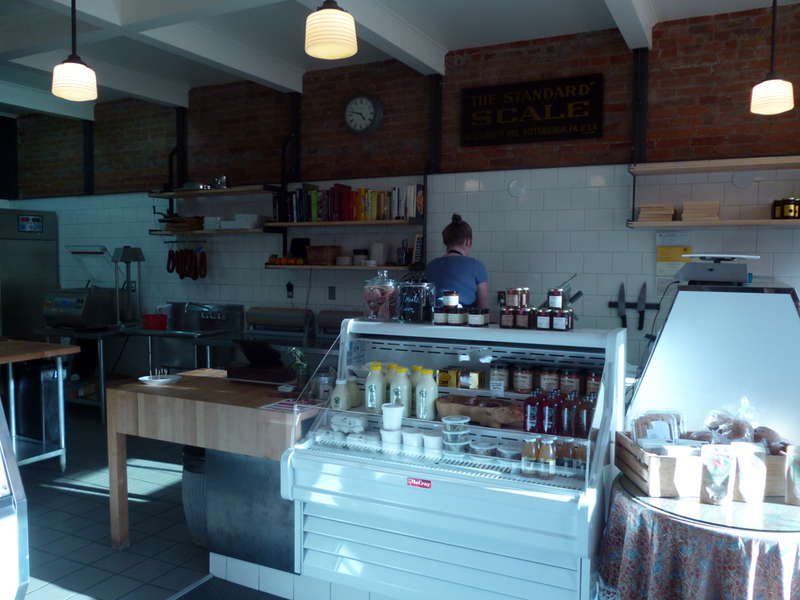 The shop also makes all its own charcuterie, with Aaron Gilliam making salamis and sausages and John Richter doing the pates, terrines, and rillettes. Malicki works closely with the three in planning menus, in order to make the most of whatever Thistle has on hand. 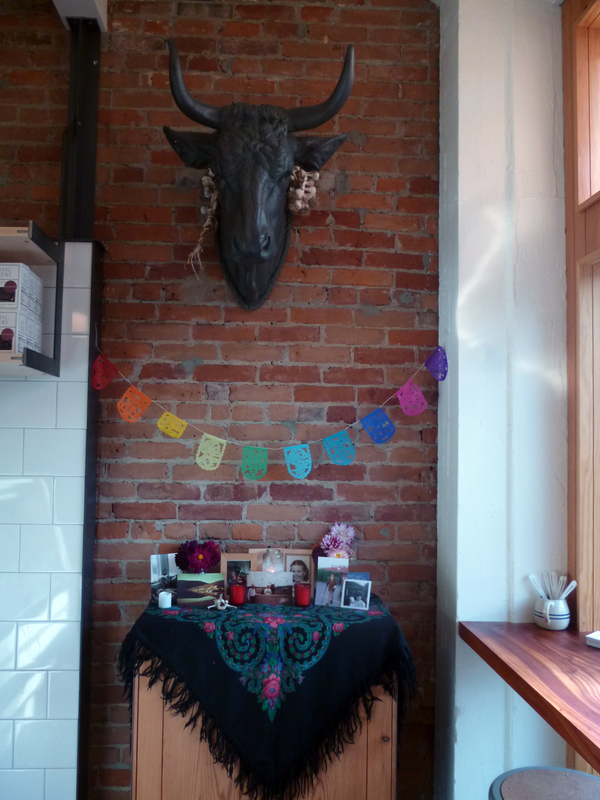 Day of the Dead display with bull head sculpture by David Best, father of Thistle Meats owner Molly Best. When I caught up with Malicki on his cell phone, he had just left Thistle and was on his way to Green String Farm, just one of the many local farms he supports through his cooking. "It's not farm-to-table cooking, it's car-to-table," Malicki said, as he listed the many farms he'll shop with during a given week. With only a shared refrigerator at the Casino, and a menu that changes daily, he shops, and cooks, as the inspiration finds him. Malicki's settings may be casual, but his fine-dining experience shows in his palate and attention to the quality of his ingredients. After working on the line at posh New York City restaurants like The River Cafe, The Odeon, and the now-closed Lutèce, Malicki started doing catering for fashion photographers, then spent 15 years as the in-house chef at Iron Horse Vineyards. Browsing for a new gig, he noticed a call for a cook in Bodega on Craigslist. A bartending friend who worked nearby at Underwood knew the Casino's longtime owners and gave the job a thumbs-up. Malicki started with one night a week; he's since built it up to four, working Wednesdays through Saturdays. "The first night I came in was the night the Giants won the World Series [in 2010]. I asked the owners, 'Is it always like this in here?'" World Series frenzy aside, Malicki has built up a following. Lucky tourists get the tip-off from friends or bed-and-breakfast owners; locals treat it like their happy secret. "It's a very open-minded town for trying different foods," said Malicki of his Bodega clientele, who order off a scribbled whiteboard and seat themselves at scuffed wooden tables in the no-frills dining room adjacent to the bar. "I can get away with a lot," he added, mentioning how in one recent night, he sold 19 orders of a salad made with Mendocino-caught raw sea urchin, scallops, and apples. And there's also the satisfaction of feeding the people who catch, raise, and grow the ingredients he works with. "I get fishermen in here, ordering fish. You can't get a better compliment than that. It feels really good when that happens." At Thistle, he's been enjoying the quality of the meat he has to work with. "You need something, they cut it right off the carcass for you," he said. The confidence of working closely with both local ranchers and the shop's butchers means he has no qualms about serving raw dishes like steak tartare. "Even the fat is so beautiful," he said. 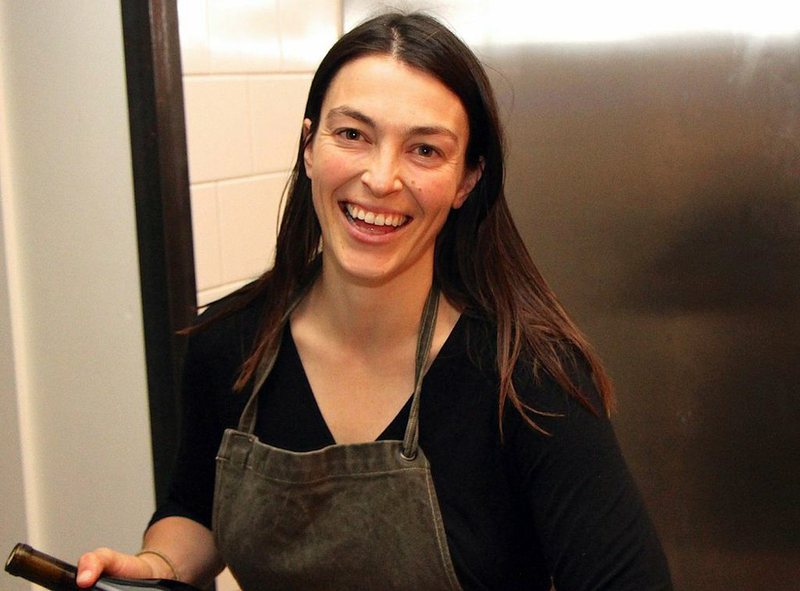 "People like to be part of something that has movement," Best said about the appeal of their pop-up in a town not lacking in established dining options. "That's the fun part."